Standing in front of the gardening tools section at a garden-centre or tool shop can be a daunting experience. There is a dizzying choice, made from a baffling array of materials. Every little job around the garden seems to have a special tool to go with it. But the good news is that you don’t need most of them: the majority of gardening jobs can be done with just half a dozen tools. No matter what job in the garden I’m setting off to do the wheelbarrow always has the same tools in it. There’s a spade; a fork; a long-handled hoe; a rake; a watering can; a folding saw; a pair of secateurs; a hand trowel; a pair of shears; some string; a roll of garden wire; some paper bags in case I see some ripe seed I want to collect; a pencil; a few labels; and a pocket knife. That’s everything I’m likely to need unless I want to do a special job. 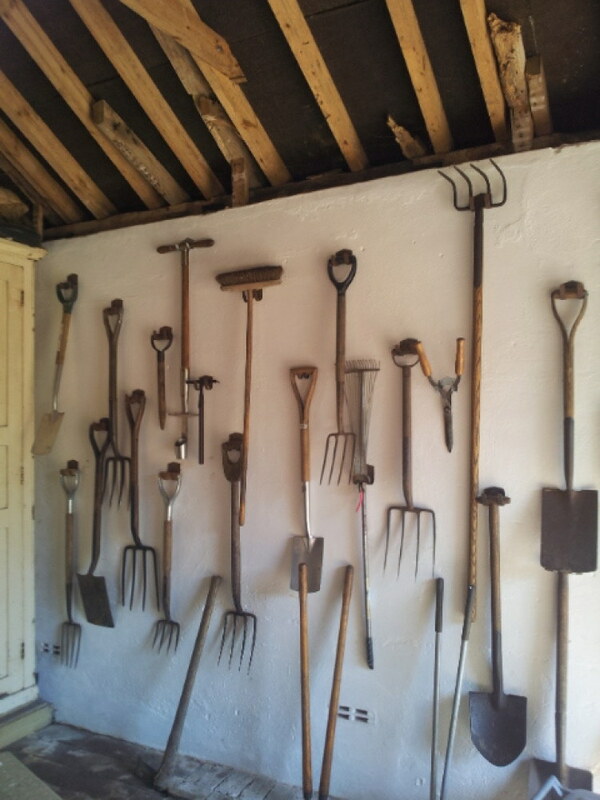 A well-stocked tool shed at Barcham, East Sussex. Digging a new bed to prepare it for planting sounds like a chore but is one of the instantly gratifying gardening jobs. You start off with messy, compacted soil and end up with a clean, virgin patch ready to be planted. And your body will have that virtuous, satisfying feel which tells you that you have done some real work. But beware: your muscles will feel that they have worked hard and would enjoy a hot bath but they should not feel painful and full of aches. Dig slowly and rhythmically and if it’s a very cold day a few warm-up exercises before you start digging are a good idea. Ignore what the neighbours might be thinking. Don’t push your body too far: you can come back and finish the job another time. The knack to easy digging is not to bend as you push the spade into the soil, then to bend your knees and use the leverage of the handle to turn the soil. Keep your back straight all the time. If you are simply loosening soil that has already been dug over, or putting manure into the soil use a fork rather than a spade. Having the right spade and fork will help you dig correctly and make the job easier. The first thing to consider is the length of the spade’s shaft. For most people the typical handle length of 70 – 72cm is adequate, but if you are over 1.7m tall you need to buy a spade with a longer handle. If you have heavy soil you can ease the hard work by using a smaller spade. These have narrower blades and therefore carry less weight. In the days when women were considered less strong than men these were called “ladies’ spades” or “youth’s spade”. (Most women gardeners, and certainly all youths, that I know can dig a great deal longer than I can). They are now known as border spades. There are also the equivalent-sized forks. Some spades have a lip at the top of the blade which makes it easier to push into the soil: useful if you have heavy clay soil. The best spades and forks are made of stainless steel. They slip into even claggy clay soils much more easily than the more common carbon steel blades, and they come out clean. With carbon steel the soil tends to stick to the blade, making the job more difficult. Carbon steel spades should be regularly sharpened and cleaned after use to prevent the blade rusting. Modern spades often have a coating to prevent rusting and to stop soil sticking. This coating always wears away so, if you can, buy stainless steel tools. Yes, they are expensive, but its coming up to Christmas – add them to you list of presents. Most digging tools have ‘D’ shaped handles but if you have large hands, or garden wearing gloves, they may be uncomfortable. Consider a ‘T’ shaped handle, which has a cross piece attached to the end of the shaft. Wooden shafts look better than metal ones and are easier to use in winter than cold metal. They do break but, unlike metal ones, can be replaced. The hoe is a simple but deceptively versatile garden tool. Its main job is to remove small weeds from around plants without you having to bend or kneel, but hoeing also vitally serves to open up and aerate the soil. 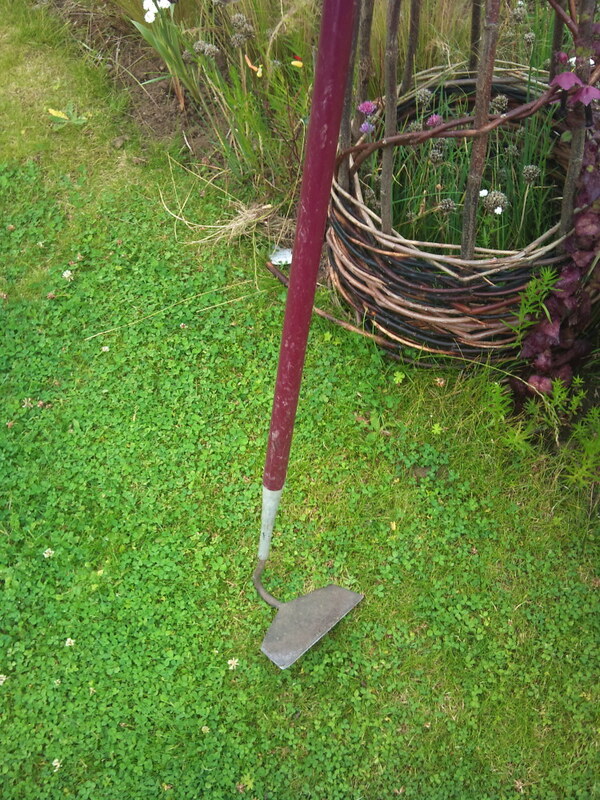 Some hoes can be used to form seed drills in the vegetable plot, or when sowing annuals directly into the garden, or for drawing up the soil around plants. Their long handle minimises effort and allows you to reach deep into beds without trampling plants or compacting the soil. What most of us in Britain think of when we talk about the hoe is, in fact, the Dutch variety. Shaped like the letter ‘D’, it has a flat metal plate that can be pushed gently under weed seedlings, at the same time breaking up the soil around plants. Don’t be too vigorous with the Dutch hoe: it is very easy to push too hard and too far, ending up slicing through the plant you are attempting to weed around. It requires a light and gentle touch. The ‘draw’ hoe has its metal plate at right angles to the handle and is pulled towards you, chopping underneath the weed seeds. Its takes more effort than other hoes, but the corner of the blade can form seed drills. When buying a hoe check that the blade has been forged, which means that it is made from the same piece of metal as the handle attachment. This gives a strong, long-lasting tool. Welded hoes are much cheaper but much weaker and at some point will break. Again, the best hoes are made from stainless steel. For light pruning and cutting back herbaceous perennials, secateurs are essential. A sturdy pair of secateurs will cut wood up to 1cm thick. The two most common types of secateur are ‘bypass’, where the blade cuts past a curved lip, and ‘anvil’, where the blade presses down against a flat piece of metal. In my experience, anvil secateurs have a tendency to crush whatever it is you are cutting, leaving behind a mangled stump. For regular, easy, everyday use the bypass type are much more convenient. Before buying a pair check how they feel: open and close them, feel their weight and how comfortable they are in your hand. They should have a notch at the bottom of the blade for snipping wire and some kind of cushioning to ease the jarring of your hand when cutting too hard. The best ones will have a system of easily replacing the blade and a mechanism for adjusting the width of the cut. At some point the spring opening will get damaged or rusted, so make sure that the spring can be replaced and that spares are easy to get hold of. In addition to your basic set of hand-tools, you may need to buy a few specialist ones. Which tools you need will depend on the type of garden you have. If you have a lawn an edging iron, sometimes known as a half-moon edger, is invaluable. It has a curved blade that cuts cleanly into the turf, leaving a clean edge. A clean-edged lawn will always give the garden a neat and tidy look, whatever the state of the rest of it is in. For trimming overhanging grass at the edge of the lawn use long-handled edging shears. Make sure that the handles are sufficiently long that you don’t have to bend and that the shears are not too heavy. If you have trees and shrubs in your garden you will need tools for keeping them trimmed. Long-handles loppers will cut branches up to 2.5cm thick. Loppers are available with a ratchet system which makes it easy to cut through thick or tough branches. For anything thicker than 2.5cm you will need a pruning saw. Remember that you are likely to have your garden tools for a long time and that you need to feel comfortable with them. Handle tools before you buy them: feel the weight, is it too heavy for you? Too long? Put your hand in the handle: imagine using it with gardening gloves on. Think how it would feel on a cold day in February. Ask the garden centre or tool shop if they have somewhere you can try out the tool (the best places do). As with everything, you get what you pay for so buy the best you can afford. A 99p pair of secateurs may seem a bargain but even your bedding plants will outlive them. Tools that have been used for years by another gardener not only look beautiful but tend to be sturdy. At second-hand shops and car-boot sales you can find inexpensive good-quality garden tools. There are now lots of specialist garden-tool dealers who also sell unusual garden tools but be careful: the line between second-hand and ‘collectable’ is a blurry one and you could find yourself paying high prices at a specialist supplier. You will get attached to your tools and even have favourites. My own is an old long-bladed trowel that I found in a second-hand shop for less than £10. It is made from one piece of metal and has a worn, ash-wood handle. You can almost feel the thumb print of the previous owner. It makes digging out the dandelions something to look forward to.